Its history dates back 4,000 years, its beaches are superb, the Mediterranean water is crystal clear, the healthy Mediterranean Diet originates here, and the sun shines for 300 days a year. This is the island of Crete, the largest of the Greek islands, a little bigger than the State of Delaware. Crete is divided into four so-called ‘regional units’: Chania (pronounced and sometimes written “Hania”), Rethymo, Heraklion (sometimes called Iraklio), and Lasithi. 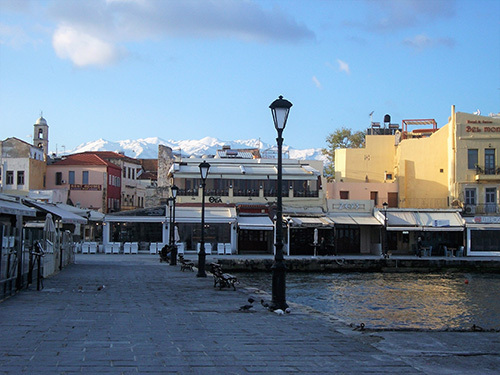 Over the next two weeks Overseas Property Alert visits Chania, with a spotlight on Chania City this week and the Akrotiri Peninsula next week. Island life is slower and more relaxed than mainland living (hoorah for that! 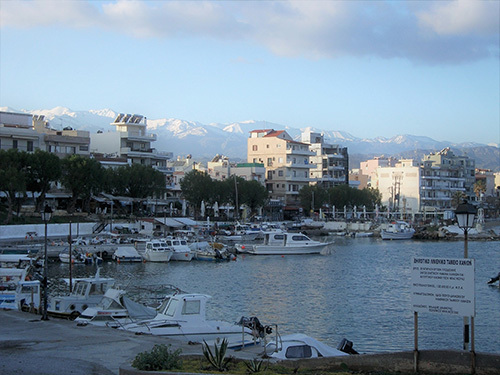 ), but Crete also has all the usual trappings of Western society with good internet, excellent bus service, two international airports, a cruise ship port, and all kinds of shops to choose from. Do not, however, expect huge freeways or mega, out-of-town malls—they simply do not exist. Most importantly, though, for Overseas Property Alert readers interested in European residency, Greece, and therefore Crete, offers non-European citizens the chance to buy property and, in return, qualify for a permanent residency visa, granting visa-free access to the whole Schengen Area. The Schengen Area includes most but not all European Union countries. For example, it does not include not Bulgaria, Croatia, Cyprus, Ireland, Romania, and the United Kingdom despite them being part of the E.U. Additionally, the Schengen Area includes some non-E.U countries–Iceland, Norway, Switzerland, Liechtenstein. The minimum qualifying property value is 250,000 euros, which can be invested in one property or several. The purchase will provide residency for you and your spouse and dependents (children up to 21 years old). 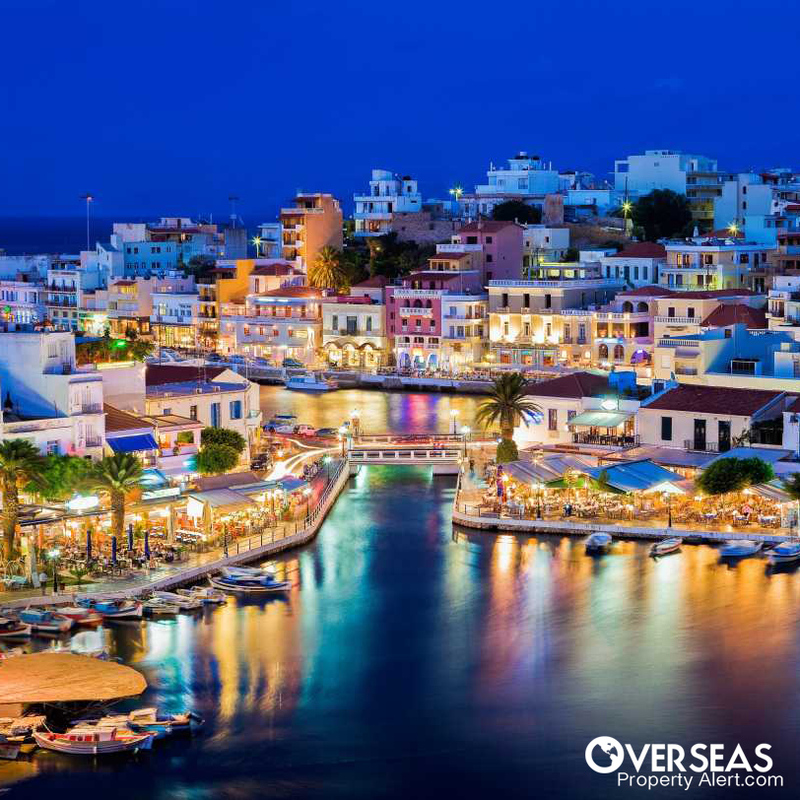 You do not have to live in Crete to maintain your residency status, and you can rent your property out once all the paperwork is finalized. The visa also gives full access to the Schengen Area. One of its few restrictions is that you may not work in Greece. If part-time living and part-time letting appeals to you, the popularity of Crete with travelers means that well-managed rentals should expect a very good occupancy rate during the high season, which is April to October each year. The real estate agency Ktimatoemporiki Crete informed me that buy-to-let investors can expect a return of 8% to 10% per year on rental property. I estimate a couple could live on a penny-pincher’s budget, renting in Chania town, for just under 800 euros a month. Alternatively, 2,000 euros per month would provide a very comfortable standard of living. Eating and drinking out, so much a part of life in Crete, is very affordable. I had a coffee at the sailing school, which is housed in a Venetian arsenali overlooking the Old Port (the most expensive part of Chania) for 2.50 euros. I ate ntakos, a local dish of crusty barley rusk topped with tomatoes, olive oil, and crumbled mizithra cheese, and a plate of tzatziki, and shared a huge Greek salad with my dinner partner who ate pork souvlaki, a meat kebab with roasted vegetables. We split a bottle of excellent local Chania wine, and all that came to just 22 euros. It would have been less off the tourist trail. Chania’s Old Town and the New Town (Nea Chora), are, as the names suggest, very different in character. The Old Town is a mass of winding streets with properties dating back hundreds of years on foundations that go back to the Minoans. Old Town properties are sturdy, thick-walled, built close together (so sometimes a little dark inside), without parking (in most cases), surrounded by extraordinary history, but also deep in tourist territory, which has its positives (lots of bars and restaurants to choose from) and negatives (noise and ever-changing neighbors). In New Town, the properties are relatively modern, in Cretan terms. I’d estimate the majority are built from the 1980s to mid-noughties. The streets are wide, there’s usually private or on-street parking, and you are more likely to find a garden or patio with a property. It’s quieter here than in the Old Town because few tourists visit (at least the day trippers don’t, which is the majority), it’s fringed by Chania town’s only sandy beach, and has some of the town’s best fish restaurants (the town’s fishermen bring their day’s catch right up to the roadside in front of the restaurants). From the Venetian harbor and the center of the Old Town it’s only 10 minutes on foot along a pretty, coastal path past the town’s only municipal, open-air swimming pool, and a five-minute walk to the city center. 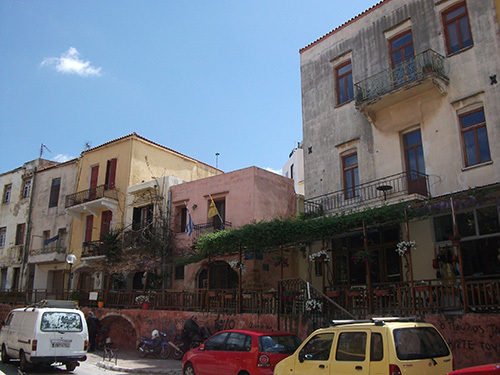 However, if history is what brings you to Crete, you’ll find New Town has less character. Some of the properties I found (noted below) are sold for prices that are short of the visa requirement. However, most of them need some level of renovation, modernization, or updating. The amount spent on the building work can be added to the property cost; in many cases that would be enough to reach the minimum 250,000-euro visa threshold. Expect to pay about 9% to 10% of the purchase price in professional fees, which can also be added to the total of the qualifying investment. All the properties mentioned are listed with either Elizabeth Estate Agency or Ktimatoemporiki Crete, both English-speaking agencies. In the Old Town, just behind the harbor, I found a three-story, 120-square-meter (1,290-square-foot) stone home with long frontages on two quiet streets, nestled in a cul-de-sac, within a maze of small streets characteristic of this area. It has the original wooden staircase, an antique oven, spacious rooms, and a roof terrace. It needs a complete renovation and modernization and is on the market for 120,000 euros. Any renovation will probably require the installation of air conditioning and central heating. (Though winters are described as “gentle,” indoors, within thick stone walls, can be frigid, and heating is essential). Just outside the walls of the Old Town close to the Agora municipal market is a two-floor, 61.5-square-meter (662-square-foot) stone town house, again needing a full renovation but with plumbing and electricity already installed, a balcony, and antique fireplace. This property is listed for 45,000 euros. If you like the idea of having a property with an apartment that is yours while renting separate floors, I found an Old Town villa that needs refurbishment, but not a complete rebuild, as it was renovated in 1990. It is arranged over three floors, with the first two floors rented out as studios (of 25 and 30 square meters, respectively), and the top floor (of 63 square meters) the main living area, with living room, kitchen, bath and one bedroom, and roof terrace. Listed for 140,000 euros (recently reduced from 200,000 euros). If you prefer to invest the full amount and not worry about refurbishment or rentals, you’ll need to purchase a property for at least 250,000 euros. In the Old Town, I found a fully-restored, two-story, 130-square-meter (1,399-square-foot) Venetian villa, with living area, bedroom, shower room, and kitchen on the first floor, and a big room, toilet, and balcony on the second floor. A steep ladder leads up to a roof terrace. Listed for 350,000 euros. A five-bed, two-bath villa I saw that is completely habitable, but needs some modernization and cosmetic work (particularly in the kitchen, bathrooms, and garden), is listed for 199,000 euros. It has its own well, a beautiful, curling wooden staircase, light rooms (many Old Town properties are quite dark), and tremendous views over to the bay and the mountains. And, lastly, for an investment of 415,000 euros, you could buy two properties in the heart of the Old Town that share a small landscaped garden, storage area, terrace, and a chapel! Once a 180-square-meter single home built in 1900, the property was converted in 2008 into two two-bed villas, both with central heating and air conditioning. This type of property could easily be a personal residence and a holiday let. I found a two-story, three-bed, one-bath house in the New Town, that’s just 300 meters (980 feet) from the sandy Nea Chora beach. The property was built in the 1980s, is 118 square meters (1,270 square feet) and has a garden and veranda. It needs modernization and some TLC and is being sold for 125,000 euros. If you prefer a look-up-and-leave property, I found a two-bed, one bath, 77-square-meter (829-square-foot), first-floor apartment in a building with eight apartments built in 2002. It overlooks the sea, with balconies (one per bedroom and one leading from the living room), electrical appliances, wooden breakfast bar, and an underground garage with a parking place and storeroom. There is heating but no air conditioning. Listed for 220,000 euros. If neat, tidy, and relatively modern (1989), with the possibility of either making a small amount of rental income or having friends and family to stay in separate quarters, interests you, then the 152-square-meter villa I saw in a quiet area of New Town would appeal. The main house has three bedrooms, two bathrooms, a pretty, well-stocked garden with an outside bar/summer kitchen, and barbecue. There are terraces overlooking the garden, the kitchen is equipped with appliances, and the house is heated and has air conditioning. At the back of the house is the one-bed, one-bath guest house. Completely ready to move in (depending on your taste, you may want to update the kitchen and bathrooms) for 350,000 euros. There you have it, the chance to obtain European residency on a Mediterranean island in a nutshell. Next week, I’ll review properties on the popular Akrotiri Peninsula, just 30 minutes’ drive from Chania Old Town. Editor’s Note: Lucy Culpepper is a Euro Correspondent for Live and Invest Overseas who has traveled to, written about, and worked in some 30 countries. She is originally from Wales in the United Kingdom, has lived all over the U.K., in Southern California, Spain, and France. Lucy recently spent seven months exploring Mexico and Central America with her husband and two children before deciding to return to Europe where she has now settled into the life of freelance editor and writer. You need to take a trip to the coastal area in Ecuador and get the latest information. You mentioned that Salinas has flights available to Quito, however, you failed to mention it’s only one flight on Friday and one flight on Sunday. Manta, on the other hand, has four flights per day all week long. Also, Manta was given the go-ahead for a direct international flight from the States. An immigration office is already planned in the new airport. Also, there are no beachfront condominiums on the beach in Salinas. They are all across the very loud street that runs 24 hours per day. Manta’s beachfront condos run all the way down the coast directly on the beach, and it’s a much longer beach than Salinas. Yes, the earthquake was horrible but, at the same time, Manta has been awarded enough money to make the city new again. Many projects improving roads and infrastructure have already begun, and many condos are like new after remodeling with insurance funds. Manta is still the fastest growing city in Ecuador and has some of the best restaurants and beautiful buildings on the coast. It definitely should be a stop on your list of coastal cities. Several months ago you wrote two articles on Puerto Vallarta. Of interest to me was your article on property just south of PV. I seem to have deleted that article. Would you please email it to me so that I may review it? I am going to PV again soon and would like to look at those properties. If you’re heading to PV, my Puerto Vallarta articles are here. Good luck with your search. Have a question? You can write to Lee (or Lucy) here. Lucy Culpepper has traveled to, written about, and worked in some 30 countries. She is originally from Wales in the United Kingdom, has lived all over the UK, in southern California, Spain, and France and has spent extended time in Mexico, Panama, and Costa Rica.